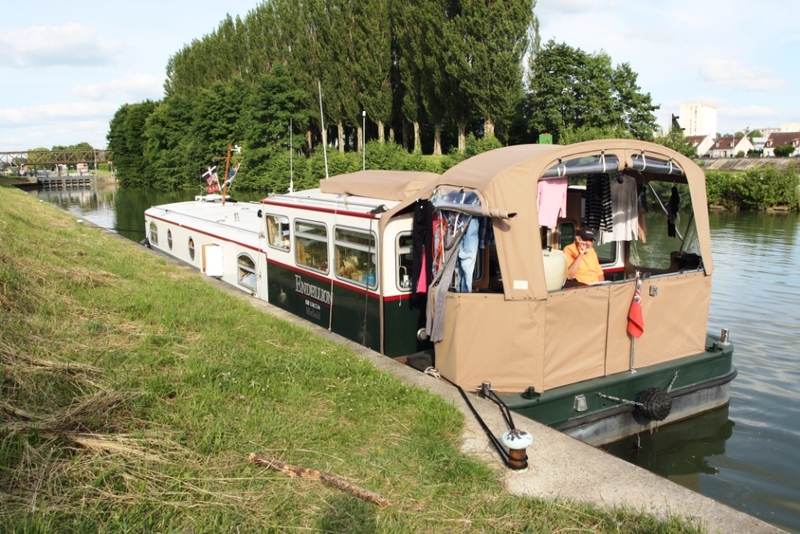 Paris to Compiegne using the Rivers Seine and Oise: 173 kms, 22 locks. A brief diversion along l’Aisne for the Armistice Clearing: five kilometres off the Oise, no locks. Compiegne to St Quentin via Pont l’Eveque using the canal lateral a l’Oise: 80 kms, 17 locks. We’re ahead of schedule (from our last blog) as of a few days ago when we left France behind us, and swapped the courtesy flag for Belgium. In our last blog we were still travelling along the Oise, a river we have used three times now and love, although this is the first time we’ve been pushing upstream against its approximately two kilometres an hour flow. The Steyr engine is feeling very, very good. The Oise has always been relatively quiet, with big and efficient locks, only occasionally a little industrial and has some pleasant places to stop along the way. Stewart in amongst the washing below the lock into Compiegne. A favourite spot of ours is the stern deck but it has to double as the laundry drying area. One of these places (after Pontoise, our last blog) was Compiegne, although we didn’t expect to stay as long as we did, five days. Compiegne is a vital stop as it has one of the few fuel depots around, an excellent boat chandlery and, in theory, good mechanics all to found at Guerdin’s. With our new Steyr engine this seemed the best place to have our first service: 50 hours. However, because we had inadvertently taken with us Alex’s (our Paris mechanic) industrial vacuum cleaner, one he seemed very fond of, he offered to do our service at the same time as collecting the vacuum. Although Compiegne is around 80 kilometres north of Paris Alex knew the boat chandlery people well and seemed to think a visit there would also be good. One of my best red buckets is used to transfer the oil from the engine on its first service. There always seems to be someone untidying my nice engine hold. As (our) luck would have it, when Alex finally arrived he’d left Paris in a hurry (we can only presume) and came without a pump to remove the engine oil for the service, he also had nothing to put the old oil into, but he did bring his toolkit. No problem thought Alex and undid, with great difficulty, the sump plug beneath the engine. 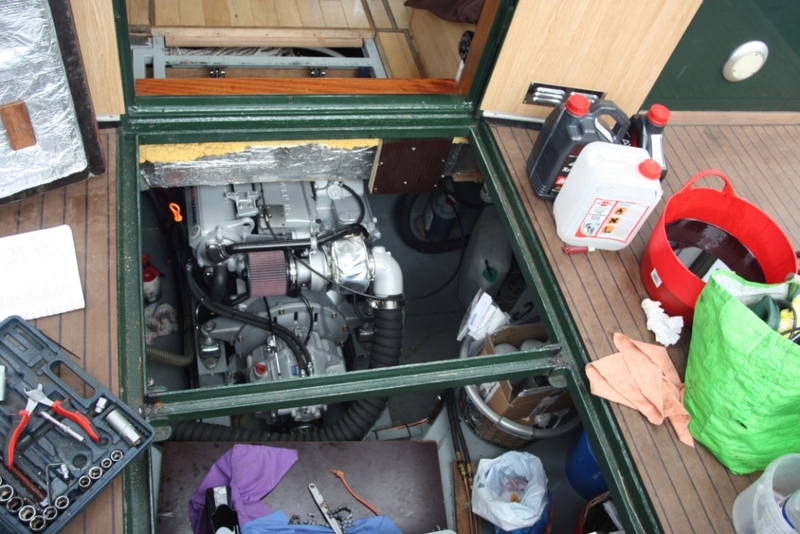 The problem with this approach, although perfectly normal with an engine with plenty of room around it, was he had to use Stewart’s shaving mirror to see where the sump plug was and had to use all sorts of contortions to finally get it undone and release the oil. Then of course what sort of container could fit underneath it when there is no space? A hand-made empty plastic container.. which worked in a way. After ignoring Alex’s giggles (which we now know is more about frustration) and his words of gentle cursing switching between English, French and Dutch, he’d managed to empty it. And after much cleaning up he put everything back together and filled the engine with new oil, and completed the checklist of other things for the first service. Great we thought, tomorrow we can get under way again. 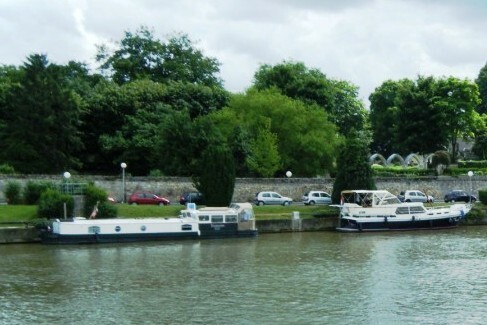 Endellion moored at Compiegne where Stewart could disembark because of the rail along the jetty. Much as we like the chandlery and being able to get fuel in Compiegne Stewart can’t get off the boat there. There is a good concrete quay that would be easy to use with one of our ramps but the council have put a very solid fence all along the quay which you can only step over, ie, the wheelchair can’t get through. The morning after the service we checked the oil again, Alex was a little concerned it was fractionally over the maximum line, and found he was almost right.. but not just a little over the maximum line it was probably one litre over. So we had to wait another day trying to find a mechanic who could empty the surplus oil. Alex explained over the phone that it was easy for us to do “it’s perfectly easy, you just need to have a little vacuum cleaner”. I wasn’t prepared to do this job (whatever it entailed) and we didn’t have whatever it was Alex thought we should use. So Pierre arrived from the excellent Compiegne chandlery and soon had the problem solved by pumping out the surplus oil up through the dip stick tube. As we had found a good mechanic we asked if he could also connect the hot water so that the engine heats it whilst we’re under way (something that was overlooked in the installation). Yes, but not until tomorrow… so of course, we stayed yet another day to make sure we had that important job done. Endellion moored at the excellent Choisy-au-Bac from there we could use cycle paths to visit Compiegne and the Armistice Clearing. All on our own until two cruisers came along. Finally we could leave . . heading only five kilometres or so to Choisy-au-Bac, near the Armistice Memorial at the Armistice Clearing (Clairiere de l‘Armistice – Rethondes). At last Stewart could disembark. The mooring was in a fantastic setting, we were all on our own and it was sunny and not too hot! We immediately set off for the Armistice Clearing, only fifteen minutes away, but arrived to find a slight glitch. 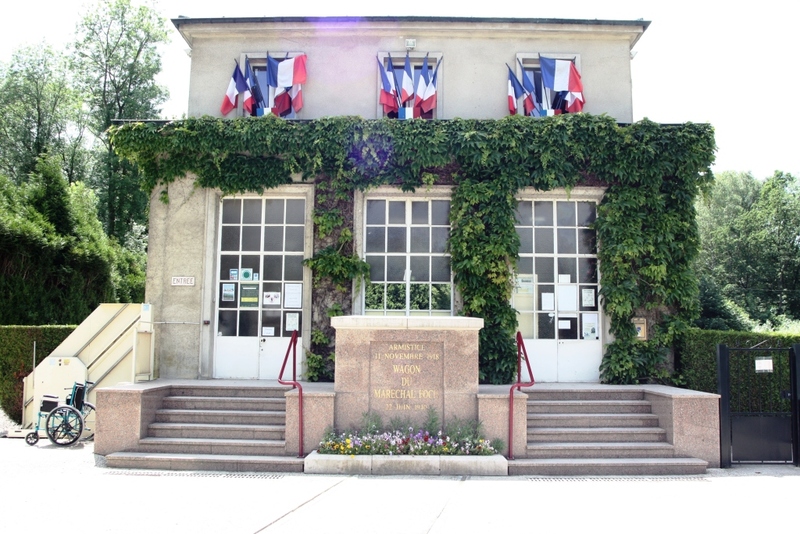 The Armistice museum near Compiegne, note the steps and lifter to left. The museum housed the replica train carriage in which the WWI Armistice was signed (the Germans capitulating to the Allies) and around twenty years later, sadly, the same carriage was used by the Germans to force France to sign the Second Armisticeat Compiegne. 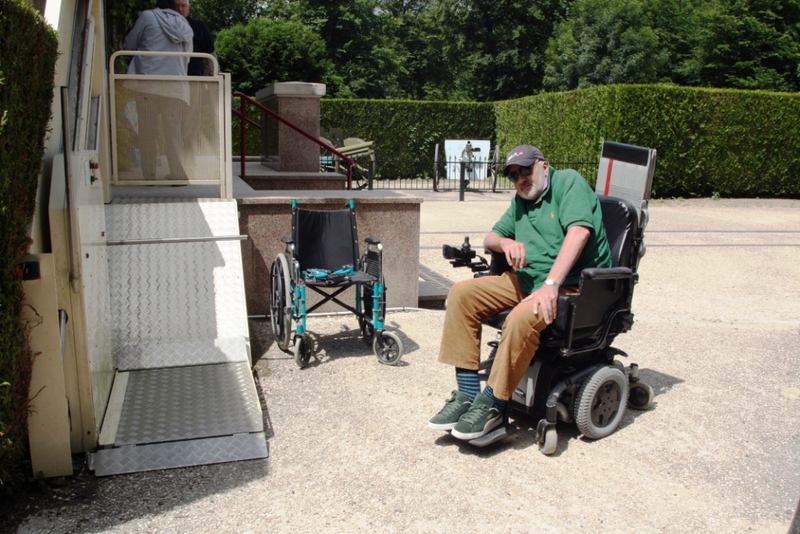 Stewart beside the manual wheelchair with flat tyres and no seat cushion, about to use the rather cranky and tiny stair lift. The glitch was the rather feeble and slightly rusty looking wheelchair lifter beside the five or six steps into the museum. When Madame at reception found the ‘lift operator’ over her walkie-talkie, he arrived and without any introduction or eye contact with us told Madame “Non. C’est electric” .. and it seems he would only accept manual chairs”, and then disappeared. We were somewhat taken aback and since I’d already optimistically paid Madame for our entry she had to reimburse us. Stewart looked very dour, who can blame him.. but this was Stewart thinking! Do you think they have a manual chair there somewhere, he asked me. I returned to ask Madame, she picked up her walkie-talkie again and five minutes later Monsieur Glum arrived and without a word started moving cables and other paraphernalia from a desk which partly hid a cupboard, just wide enough to hide away a dusty old manual wheelchair! Well I never. It had completely flat tyres, no seat cushion and the feet rests were detached but I told him we should give it a go. Reluctantly Monsieur carried the chair down the steps and Stewart and I put it together, he transferred into it and we could push it despite the flat tyres, no seat cushion and appalling state. So Monsieur had to operate the lift for us and up Stewart went, we paid Madame our entry fee once again, and in we went. 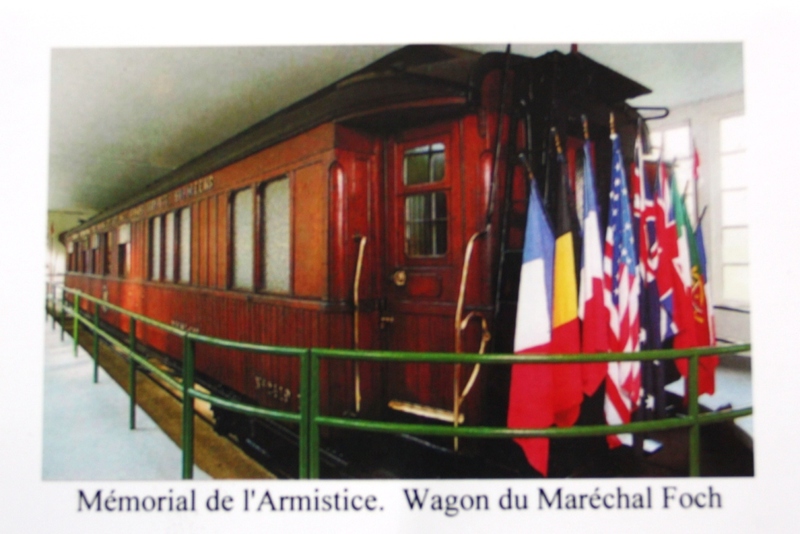 From the postcard, the train carriage used for signing the Armistice to end WWI and twenty years later to sign the WWII Armistice between France and Germany. 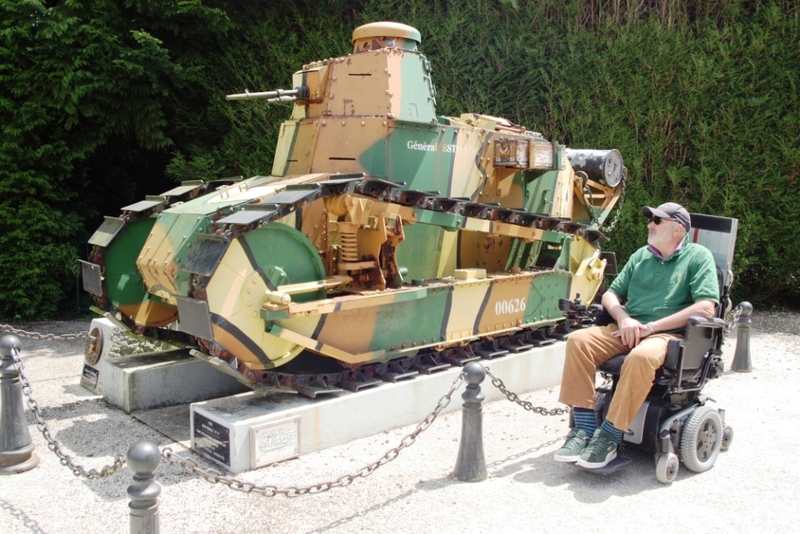 Stewart beside an early model French tank at the Armistice Clearing. Beyond the first section with the replica train carriage there is a raised area which required another chair lifter, also a slightly antiquated model but we thought it may still work. However it was locked so I had to walk back through the room with the train carriage to Madame at reception and ask if we could use the lifter for the next section of the museum, you guessed it: Madame picked up the walkie-talkie, I returned to Stewart and five minutes later, through a side-door (which was difficult to unlock but he managed it) in came Monsieur Grumpy and without a word to us he unlocked the lifter with his set of keys, Stewart pushed himself onto the ramp in the chair with flat tyres, up he went and we continued enjoying the museum. Of course I had to walk back to Madame to ask for Monsieur Grumpy to return to unlock the lift to descend. For some reason they hadn’t anticipated this was going to be required. Once descended with Grumpy and his set of keys, instead of steadily finishing the final section we decided not to let him leave us again without letting us out of the building. 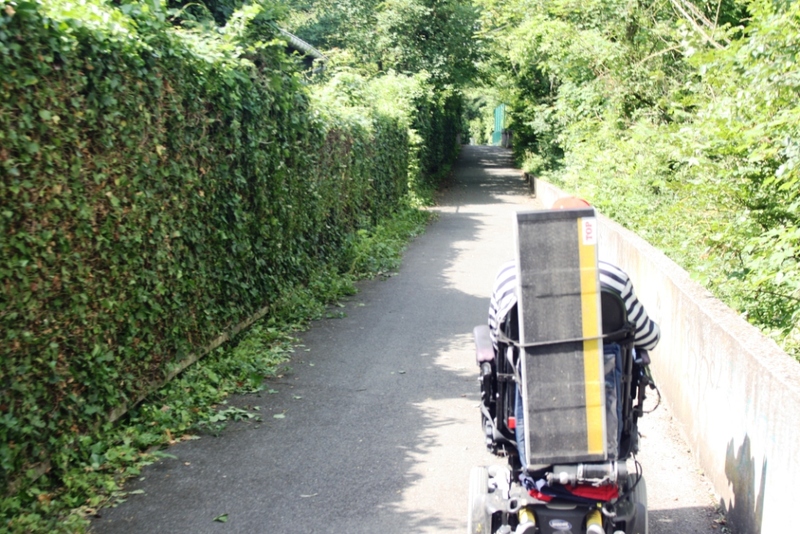 Stewart loving the cycle path from our boat to the centre of Compiegne, where the city has put a fence to stop wheelchair users getting off! We tell all of this because at the end of the day, when we had returned to Endellion via the beautiful green cycleway, flat and smooth all the way, we laughed about the experience and thanked the council for at least making sure the cyclists had a lovely smooth ride! The mooring at Choisy-au-Bac was even better than we’d hoped so the next day we decided to use the excellent cycle path into Compiegne city, only 20 minutes away for a first ever visit for Stewart (given each time we’ve stopped previously he couldn’t disembark). 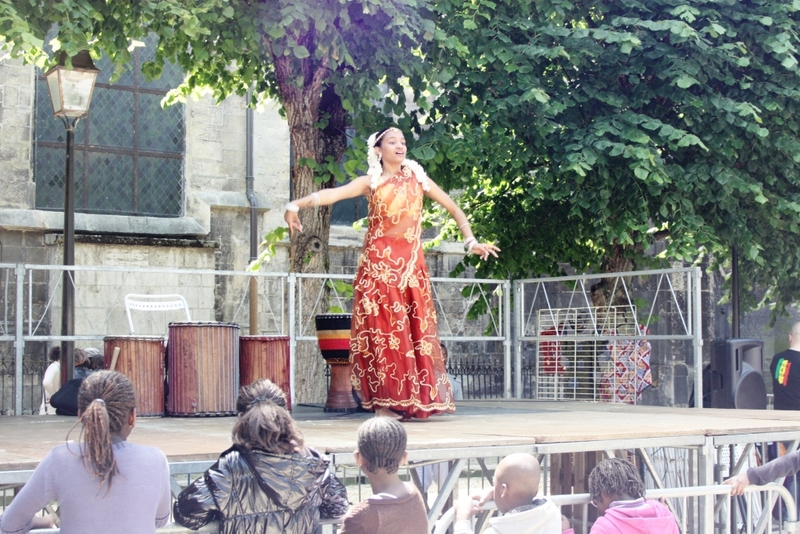 Dancer at a surprise community dance performance in Compiegne. 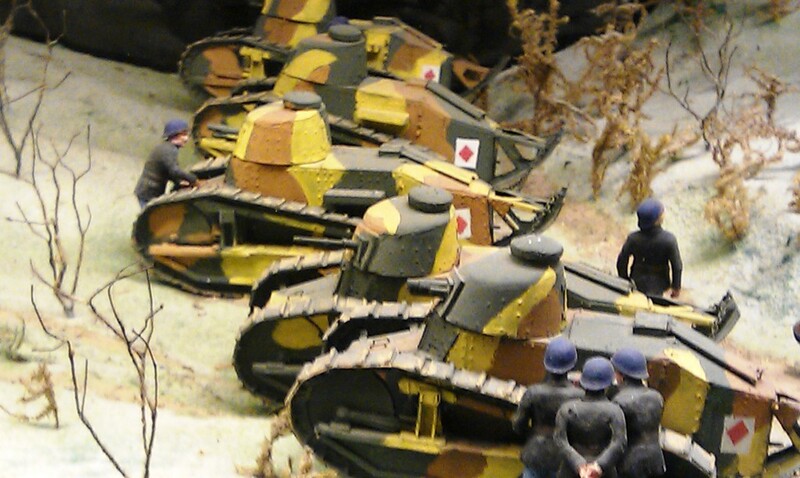 Models of the same French tank as we saw at the Armistice Clearing, these are at the Figurine Museum in Compiegne. 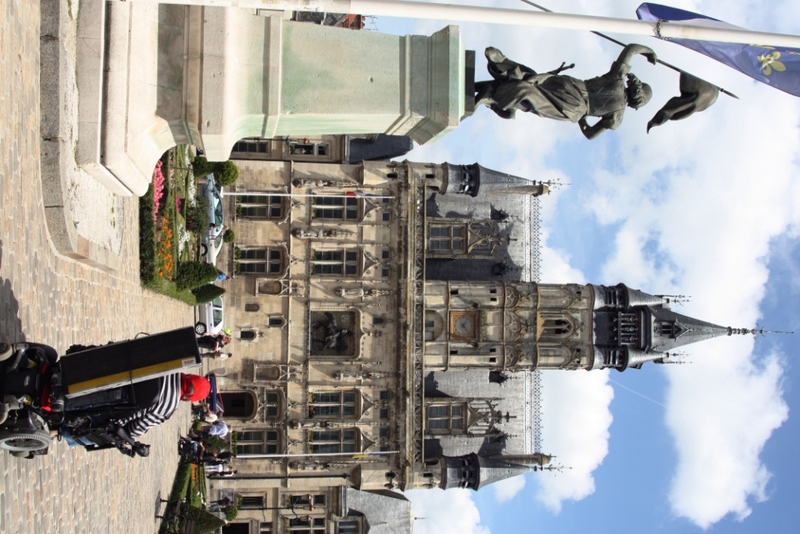 A lovely city, in particular we enjoyed watching a local cultural dance and theatre performance beside the church and the figurine museumwith 100,000 tin, lead, card and papier-maché figurines, recounting the military and civilian history of France. 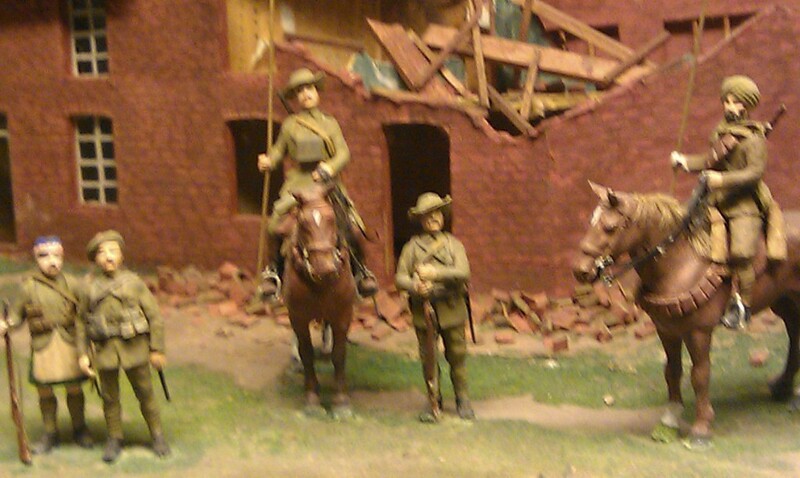 Australian troops – figurines at the museum in Compiegne. It was amazing. 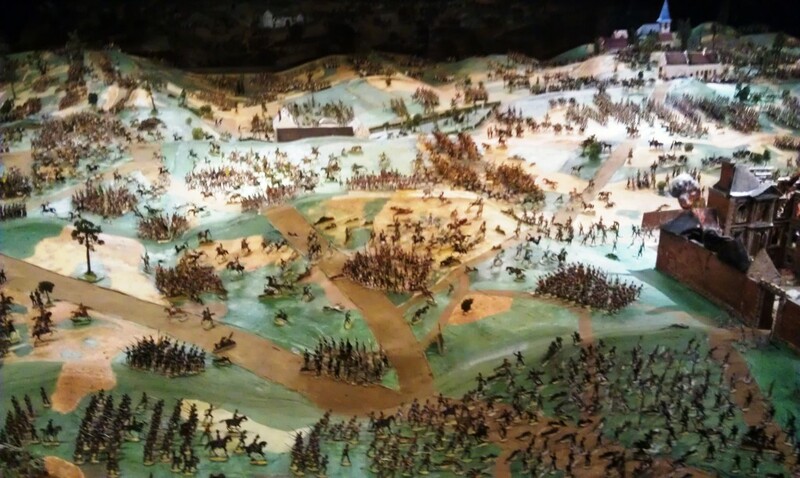 From the website link we also learnt that the vast model of the battle of Waterloo, by Charles Laurent, for greater accuracy he used charts from Belgian military headquarters and worked on the reconstitution for 18 years (1905-1923). It’s a special museum in our view. So with Stewart’s first visit to Compiegne the city (rather than the boat moored to its quay) delightfully completed we headed for Pont l’Eveque. On our last visit (two years ago) Stewart had spotted what looked like an excellent restaurant, Auberge Pont l’Eveque. 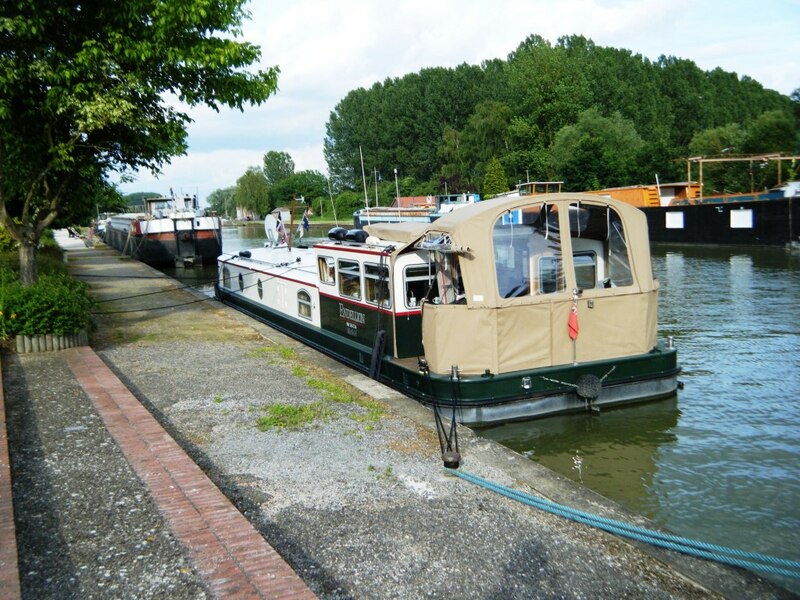 Endellion moored at Pont l’Eveque where Stewart had been lusting after the food at the Auberge. It had received a Michelin award of some kind and as it had three steps to the entrance Stewart couldn’t go inside at the time but was sure it would excellent and in his dreams we’d revisit one day. 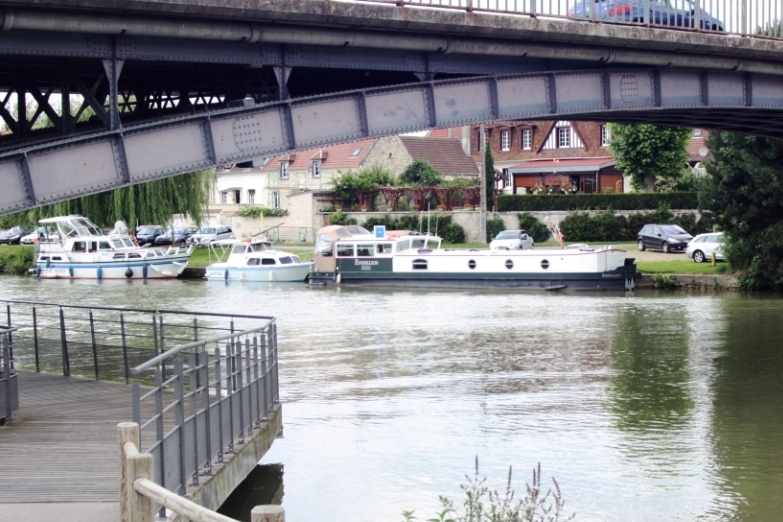 Throughout our days in and around Compiegne he really couldn’t wait to get Pont l’Eveque, even though, when several of our fellow-boaters heard his story about how good it will be when we get to Pont l’Eveque, others doubted there was such a great restaurant there. We’d worked out where we could moor as it had to be very close to the restaurant to make it relatively easy to carry our medium-sized (1.6 metres) ramp to manage the three steps. We had a very enjoyable lunch, although the only person properly impressed seemed to the owner/chef who admired our ramp. He explained that within twelve months he had to provide wheelchair access for his restaurant and would be putting in a lifter beside the steps. Let’s just hope it’s not the type that was ‘made available’ to us at the Armistice museum!! Our next stop was Chauny .. again we were revisiting old familiar places (see our blog for 2009). We arrived to find that Pat and Ron, who was one of the harbour-masters two years ago, were still there with their boat. They commute between Lyme Regis, Dorset, and Chauny, Picardie so we were lucky our one night coincided with them visiting their boat. 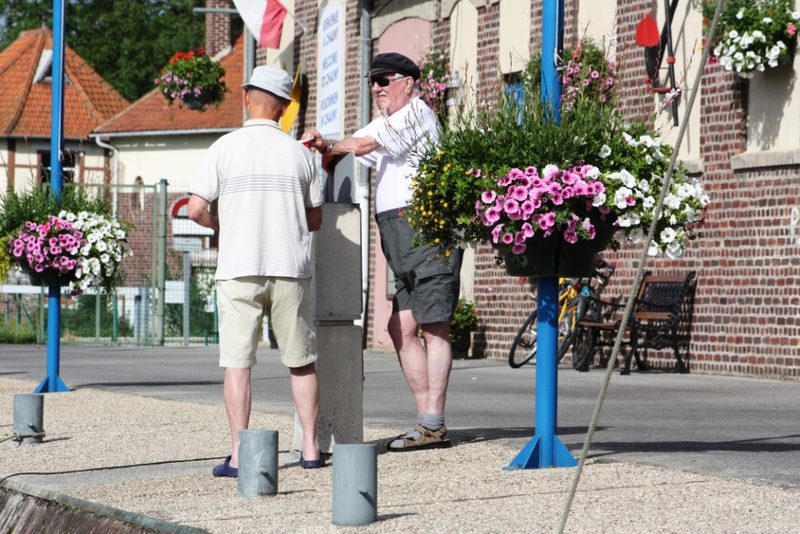 Dear Ron (to right) giving advice to a ‘plaisancier’ (pleasure boat person like us) at the charming Port at Chauny. Ron has a wonderful approach to speaking French, he told us two years ago when we asked if he spoke French, “oh no, I just speak English with a French accent and everyone understands me”. Ron is a champion .. we heard him in ‘conversation’ with a local Frenchman and not one word of English was spoken by the local and not one word of French by Ron. We’re not sure just how much they understood each other but both seemed content. 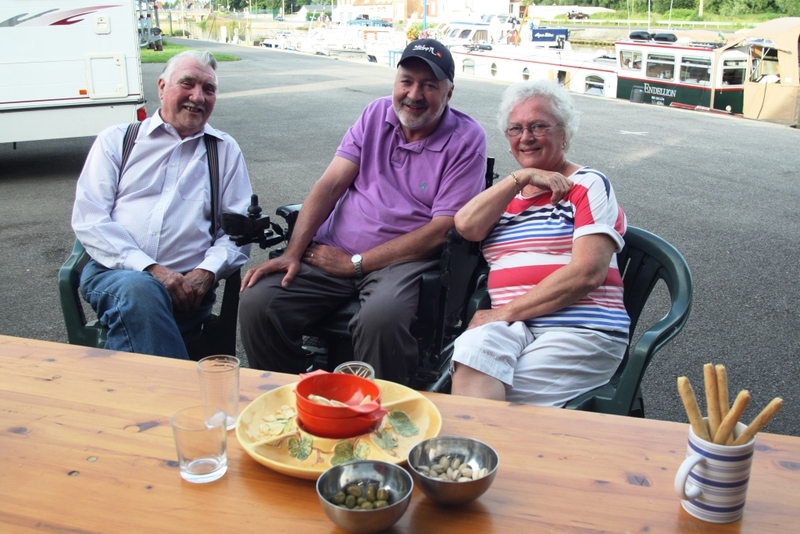 We had a special evening with Ron and Pat sitting at a table they’d dressed with nibbles and quite a selection of drinks: scotch (Ron’s favourite), Gin and Tonic (Pat’s) and other spirits, all set on the quay outside the big shed. No-one overindulged, it was a warm and happy evening. Ron, Stewart and Pat at their table on the quay at Chauny. The next day we were heading on for the port at St Quentin which is the closest safe mooring south of the almost six kilometre tunnel at the summit of canal St Quentin. Pat had told us the port may now be closed as the local council had handed it over to the VNF (French Waterways) and the VNF were not operating it for travelling boats. Before we arrived in the port we asked one of the few lock-keepers around if he thought we could moor there overnight. We didn’t receive a yes, but we certainly didn’t receive a no. We found the quay we’d used on our last visit available and moored up, plugged in the electricity and happily settled in for dinner. Later when I finally saw a man who came and opened up a big shed beside us I asked if it was OK for us to be there. He didn’t seem too worried but just as he was telling me it’s not really open now (in French) a woman came out from what used to the house of the Harbourmaster and started berating us. We shrugged, everyone got on with what they were doing before and we stayed regardless. But not a nice feeling. The following day for almost two hours we were towed through the long Grand Souterrain (big tunnel) not through any mechanical problem with our boat but like every other boat wanting to use this tunnel. To come in our next blog. We send love and best wishes to family and friends. This entry was posted in Accessibility, History, Waterway life, Waterway services and tagged Compiegne, Endellion barge, Facts and figures, MS, Restaurants, Travel, Waterway services, Wheelchair access. Bookmark the permalink. How many moorings with power and water are there between Paris and Compiegne and then Compiegne and Saint Quentin. Port Van Gogh on the Seine near Clichy – always looks crowded but have never stopped there. ‘Boat Paradise’ at Conflans on the Seine, we stopped there for repairs, very tight in and out. From Compiegne we only noticed Pont l’Eveque and Chauny before St Quentin. We are members of the DBA (Barge Association) in the UK who have extremely helpful members and an excellent Moorings Guide… highly recommended.